If you go to your local Craigslist page and search under “Appliances,” you’ll find virtually endless listings of new and used refrigerators, washers, dryers, stoves, and other household items. Should you be in the market for a new appliance, there’s no shortage of buying opportunities. But when Ryan Finlay of Portland, Oregon, looks at that same list, he sees a business opportunity. Finlay makes his living buying used appliances advertised on the classified ads site, repairing them as needed, and then selling them to new owners at a profit. It was a niche he discovered almost by accident. After quitting his job as a contractor and looking for a new venture, he started buying and selling products through Craigslist, just to see what might happen. Finlay’s role as a reseller may not necessarily a groundbreaking concept. But his leveraging of Craigslist’s free platform to spot buying and selling opportunities reflects a keen entrepreneurial eye, and a sharp awareness of how an individual can carve out a profitable business niche with little in the way of start-up capital. (His office is essentially a Toyota Tundra pick-up truck, supplemented with a trailer and his smartphone). Finlay’s business reflects a new strain of web-enabled “micro-entrepreneurship,” as James Wong defined it in a May 2012 Fast Company article. Micro-entrepreneurship can also represent a creative response to a tough economic climate; Finlay says his Craigslist reselling business stemmed from dissatisfaction with traditional employment, coupled with the limitations of not having a college degree. (Other examples of creative micro-entrepreneurship in action recently covered by Free Enterprise include a look at how the “sharing economy” is rewriting traditional buyer-seller relationships, and how the “maker movement” is kick-starting a manufacturing renaissance in Pittsburgh). It’s an entrepreneurship business model Finlay discusses openly on his blog, ReCraiglist.com, where he details sales and negotiation techniques, offers advice on how to craft solid ads, and reports on the ups and downs of self-employment. In one recent post, Finlay lays out his work plan for a typical Saturday, which tends to be one of his busier days in the week. In April, he broke down his most profitable day of sales, tracing how he scored a profit of more than $700 for one day’s work. A March post detailed how what Finlay deems the top 10 items to buy and sell on Craigslist. Unlike some entrepreneurs who portray their ventures as a series of uninterrupted successes, Finlay is also open about the times when things don’t go as well as planned. 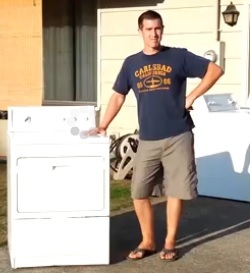 In a July 23 blog post titled “How I Got Swindled,” he details how he ended up on the short end on a deal to purchase a washing machine and refrigerator. It’s a cautionary tale, illustrating how not every deal can be a winner. But rather than dwelling on the loss, he puts it into the “lessons learned” category and moves on. ReCraigslist.com has garnered wider media attention for Finlay’s business model. In October 2011, he published a guest article in Forbes talking about his business, and he’s hosted a Q&A session for readers of the popular website Lifehacker, along with guest posts on other sites. Finlay doesn’t seem concerned that sharing the secrets of his tradecraft will create unwanted competition. Instead, he’s positioning himself as a guru to others who might want to pursue a Craigslist reselling business. He’s expanded his portfolio by offering coaching services to budding Craigslist entrepreneurs for $50 per hour. It’s a form of diversification that many micro-entrepreneurs embrace. Of course, Finlay isn’t the first person to use Craigslist as an avenue to success. Another unconventional Craigslist entrepreneur is 15-year-old Willow Tufano of North Port, Florida, made headlines in 2012 for selling electronics and appliances via the free classified site, and then using the proceeds to invest in rental homes. (And she hopes to turn her experience into a reality show, “Teenage Landlord”). And in 2010, Steven Ortiz, a 17-year-old resident of Glendora, Calif., made national news when he turned an old cell phone into a 2000 Porsche Boxster by skillfully executing a series of 14 escalating Craigslist trades. Most of all, the example of Finlay and other Craigslist magnates illustrates that even in a sluggish economy, the entrepreneurial urge takes many forms, and that it doesn’t take an MBA—or even a college degree—to launch a workable business at low cost.